Leo Donnelly, Special Counsel for Chen Palmer Partners, spoke to Lynda Chanwai-Earle on the Asia Media Centre on the Japanese elections. Japan’s ruling party, the Liberal Democratic Party (LDP), will be electing its next president at its leadership election on 20 September. Incumbent president and current Prime Minister Shinzō Abe is running for re-election after a party rule change in 2017 allowed him to seek a third term. Also vying for leadership is former defence minister Shigeru Ishiba. Abe is highly likely to return to office, and he is expected to push for change to Japan’s pacifist constitution. What significance does the LDP election have for Japan, and what are the implications for New Zealand? The Asia Media Centre spoke to Japanese-New Zealanders and academic experts for their comments. “One significance of the election is that it is a test for Prime Minister Shinzō Abe’s political leadership in various aspects. Since his return to the office in 2012, Abe has undertaken Abenomics (deflation and GDP growth for example), security legislation reform and many more. The election will highlight whether Japan is calling for Abe’s continued leadership in further development in economy and politics, or a new and fresh start by Ishiba. “Both Shigeru Ishiba and Abe are keen on revising the constitution. Whoever does it, the country’s constitutional revision will be a historical event for post-WWII Japan. Over seven decades, no prime ministers have managed to revise it. As domestic society and the international environment change over time, there may be a need for the constitutional change. “Japan’s next prime minister will be decided, so the LDP elections are quite significant, but Shinzō Abe is bound to get re-elected so rather than the elections per se, the way he is going to win is important. A sweeping victory would mean a broad mandate for Abe to pursue his most important policy initiative – the revision of the constitution. “The 2017 land purchase scandal surrounding by Shinzō Abe, his wife and his close friends had an impact on his popularity. The Nikkei Shimbun’s public opinion poll result showed that 39 percent of the respondents expressed their support whereas 52 percent didn’t. However, his popularity returned over a year with 48 percent in favour and 42 percent against. “Shinzō Abe has been in power for a long time to build relations with other countries, while Shigeru Ishiba will have to start building relationships and trust. This could be a plus in terms of countries like China, but maybe not with other countries like Trump’s US. “[Abe’s time in power] has been long, but this will be the last term. The LDP has mostly dominated in post-war Japanese politics, and due to the powerful bureaucracy a change of PM does not mean major policy changes. Abe will push to revise the constitution as it is his last term. He would like to be remembered for making history – the constitution revision has been his goal for many years. “Abenomics has enabled Shinzō Abe to hold his position for as long as he has. Economy has been the main concern of recessionary Japan, and his Abenomics has seen positive economic indicators. GDP and stock prices have risen, the unemployment rate has gone down, even though it is questionable to what extent people’s living standards have actually improved with Abenomics. “Parallels between [the LDP Party rule change allowing Shinzō Abe to run for a third term] with other world leaders such as Russia’s Putin or Turkey’s Erdogan who have introduced various legal changes that enabled them to stay in power, are unavoidable. At the same time, the change was in the Party rules not in the general legal structure; Japan remains a democracy, and so far Abe has not done anything that will undermine the electoral system and make it less democratic. “Nine years in power can be seen as long, but it depends. John Key served as New Zealand’sPrime Minister for eight years, many US presidents serve for two terms, in South Korea the presidential term is only five years and often is seen as too short … Moreover, until recently, Japan has often been criticised for having a very weak political leadership, with PMs changing almost every year. “To a great extent, Shinzō Abe has managed to pull up the Japanese economy in the last five years by implementing monetary policies assertively and boosting exports. Although his Abenomics is far from perfect, surely MPs from the LDP, the voters and the general public have been asking, ‘Who would be his alternative?’. “Internationally, Shinzō Abe has established relatively good personal relations with US President Donald Trump and Russian President Vladimir Putin, so his re-election will probably be welcomed in these countries. Contrastingly, his relations with China’s Xi Jinping and South Korea’s Moon Jae-in are far from good, so the historical memory and territorial disputes-related tensions will probably continue. “Under his Abenomics in the last five years, Shinzō Abe signed the CPTPP, along with the Economic Partnership Agreement with the European Union. Abe is expected to continue to push these free-trade agreements forward. In fact, Abe recently reaffirmed his pro-free trade policy contrasting himself from Trump’s US trade sanctions. Generally, New Zealand and Japan led by Abe (if he were to be elected) will be on the same page as far as the CPTPP is concerned. Is the LDP election of interest to you? “Yes, because the leader of the LDP will usually become the Prime Minister of Japan. Since 2012, this has been Shinzō Abe. Up until recently, the general expectation has been that Abe’s hold on the LDP leadership and role as Prime Minister is secure. But news commentary suggests the impact of recent political events, such as the Moritomo Gakuen scandal, may have made his position less secure. What’s the significance of the LDP elections for Japan? 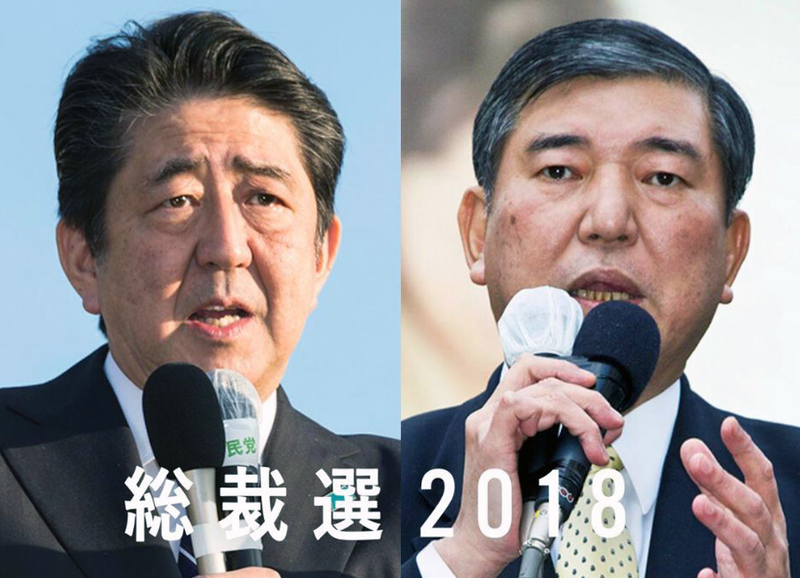 “Whoever comes out on top, if the new LDP leader is not perceived to be secure then public and business confidence in the Japanese government may be affected and that may impact on their engagement with countries like New Zealand. Will the result have significance in New Zealand? “The Japanese-New Zealand community has an obvious personal interest. But the wider New Zealand community – business and otherwise – also has an interest in the outcome of the LDP election. The recent public debate about the merits of New Zealand’s involvement in the CPTPP have raised public awareness of the political brokering that sits behind trade agreements. “Whatever side of the debate one supports, I think most New Zealanders get that it’s not just about trade. New Zealand is a small player as opposed to dominant players like China, the USA and Japan, but it has a real interest in how these countries approach trade and economic growth, and what opportunities and risks this provides for New Zealand. If there is a change of PM in Japan, or fragmented support, this may affect New Zealand’s best interests.